Wallerian degeneration (WD) after ischaemic stroke is a well known phenomenon following a stereotypical time course. Whereas conventional magnetic resonance imaging fails to detect signal intensity changes until four weeks after stroke, diffusion tensor imaging (DTI) reveals changes related to WD only after days. DTI was used to monitor the time course of Wallerian degeneration of the pyramidal tract from the early subacute to the late chronic stage of ischaemic stroke in two patients. A progressive decrease of fractional anisotropy was found along the pyramidal tract in the cerebral peduncle below the primary lesion resulting from progressive changes in the principal diffusivities, as well as a slight increase in the orientationally averaged diffusivity in the chronic phase. These signal changes reflect the progressive disintegration of fibre structures resulting from WD. No longitudinal DTI studies of WD have been published. Here we report the findings from diffusion tensor images obtained for two of our patients at three different time points during the time course from the early subacute to the chronic stage of stroke. Two patients with striatocapsular infarction were examined at three time points after stroke (case 1: 12, 104, and 288 days after stroke; and case 2: 5, 35, and 92 days after stroke). DTI revealed a clear pattern of progressive structural changes, which corresponded well with histological findings on the temporal evolution of WD and with DTI findings of WD in the chronic stage after stroke as described above. In both patients the rFA decreased continuously (from 0.84 to 0.75 and from 0.83 to 0.62) and the rDav increased slightly (from 0.98 to 1.11 and from 0.96 to 1.02). Ratios for the second (rλ2) and third (rλ3) eigenvalues markedly increased over time in both patients (rλ2: from 1.07 to 1.29 and from 1.02 to 1.10; rλ3: from 1.05 to 1.27 and from 1.06 to 1.28). An example of progressive FA decrease along the pyramidal tract below the primary lesion over time is shown in fig 1. Corresponding structural changes are clearly visible on the coregistered high resolution T1-weighted image in the late chronic stage, where a hypointensity resulting from degeneration of descending tracts in the mediolateral cerebral peduncle is easily identified. Time course of wallerian degeneration (WD). A slight decrease in fractional anisotropy (FA) was found along the affected pyramidal tract below the lesion 12 days after stroke on coronal as well as on transverse sections at the level of the cerebral peduncle. The decrease in FA became more pronounced after 104 and 288 days (small white arrows). On the T1-weighted (T1-w) images the area of the primary lesion shows the typical progression from a slight hypointensity in subacute infarction to a well defined structural defect in the chronic stage (large black arrows). 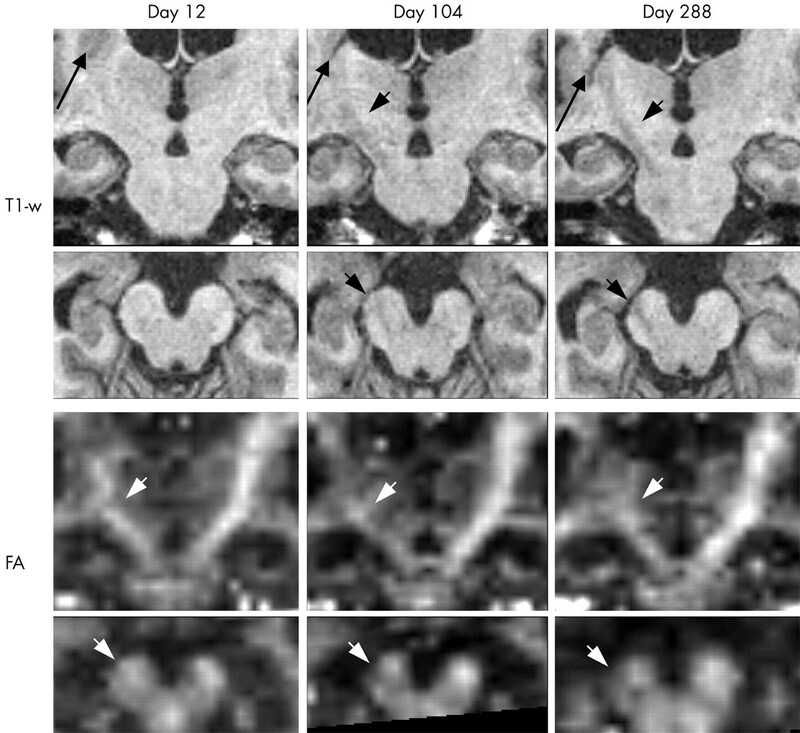 Although after 12 days no pathological signal changes along the pyramidal tract were found, after 104 days, and even more definitely after 288 days, a clear hypointensity became visible along the descending pyramidal tract (small black arrows) representing typical signal alterations found in the chronic stage of WD. Transverse sections through the cerebral peduncle reveal limiting of WD to lateral parts of the pyramidal tract on both T1-w and FA images at days 104 and 288. Structural changes in WD evolve over time with progressive destruction of fibre structures followed by gliosis.1,2 We found progressive loss of anisotropy resulting from reduced first eigenvalue and increased second and third eigenvalues. We interpret these changes as a reflection of the progressive structural alterations resulting from WD. Moreover, although in the early subacute stage no clear changes of the orientationally averaged diffusivity can be detected,8 in the chronic stage, with progression of structural degradation due to WD, an increase in the Dav becomes obvious. The findings of the present report have to be interpreted with caution as they are based on only two cases. In previous DTI studies, a 15% decrease in FA was found in the cerebral peduncle two to six months after stroke in one study,6 and a 32% decrease in FA was found in the cerebral peduncle below the lesion in patients more than one year after stroke in another study.7 Although these findings are from different populations in different studies, they also appear to indicate a pattern of more pronounced loss of FA at later time points after stroke. In any case, the extent of WD after stroke may vary over a wide range in different patients, depending on the extent of the primary lesion and its location in relation to the affected fibre tracts. In our two patients the decrease in FA advanced from 16% to 25% in case 1 and from 17% to 48% in case 2, during a time course covering more than nine months and three months, respectively. WD of the pyramidal tract after ischaemic stroke is known to reflect severe pyramidal tract damage associated with persisting impairment of motor functions.10,11 In patients with ischaemic stroke and motor impairment, the degree of WD of the pyramidal tract has been shown to be correlated to motor scales at different time points.8 In both our patients the DTI findings of a typical pattern of progressive WD were associated with persisting moderate to severe hemiparesis. DTI allows evaluation of the time course of WD from the early subacute to the chronic stage. The findings on imaging reflect the different stages of WD that are well known from experimental and histological studies. Thus, DTI offers a way to detect and monitor the time course of severe degeneration of the pyramidal tract and may be a helpful tool in forecasting and monitoring recovery in patients with ischaemic stroke. Johnson AC, McNabb AR, Rossiter RJ. Chemistry of wallerian degeneration. A review of recent studies. Arch Neurol Psychiat1950;64:105–21. Lampert PW, Cressman MR. Fine-structural changes of myelin sheaths after axonal degeneration in the spinal cord of rats. Am J Pathol1966;49:1139–55. Kuhn MJ, Mikulis DJ, Ayoub DM, et al. Wallerian degeneration after cerebral infarction: evaluation with sequential MR imaging. Radiology 1989;172:179–82. Basser PJ, Pierpaoli C. Microstructural and physiological features of tissues elucidated by quantitative-diffusion-tensor MRI. J Magn Reson B1996;111:209–19. Beaulieu C. The basis of anisotropic water diffusion in the nervous system—a technical review. NMR Biomed2002;15:435–55. Werring DJ, Toosy AT, Clark CA, et al. Diffusion tensor imaging can detect and quantify corticospinal tract degeneration after stroke. J Neurol Neurosurg Psychiatry 2000;69:269–72. Pierpaoli C, Barnett A, Pajevic S, et al. Water diffusion changes in Wallerian degeneration and their dependence on white matter architecture. Neuroimage 2001;13:1174–85. Thomalla G, Glauche V, Koch MA, et al. Diffusion tensor imaging detects early Wallerian degeneration of the pyramidal tract after ischemic stroke. NeuroImage 2004; (in press). Nolte UG, Finsterbusch J, Frahm J. Rapid isotropic diffusion mapping without susceptibility artifacts: whole brain studies using diffusion-weighted single-shot STEAM MR imaging. Magn Reson Med2000;44:731–6. Binkofski F, Seitz RJ, Arnold S, et al. Thalamic metabolism and corticospinal tract integrity determine motor recovery in stroke. Ann Neurol 1996;39:460–70. Watanabe T, Honda Y, Fujii Y, et al. Three-dimensional anisotropy contrast magnetic resonance axonography to predict the prognosis for motor function in patients suffering from stroke. J Neurosurg 2001;94:955–60.